The Cartoons by Josh Calendar 2019 is now sold out. If you wish to go on a waiting list for a second print run please email/contact me. If there are enough orders I will organise a new print run in January. This year the Calendar is back to the larger size – 42 x 29.7 cms (A3) in size, with half the space for diary dates and folded to A4. It is beautifully printed on 170gsm silk paper by my brilliant local printer. Post and packing is included in the price. I hope to have an actual print to show very soon – I will be updating this page in the next few days. 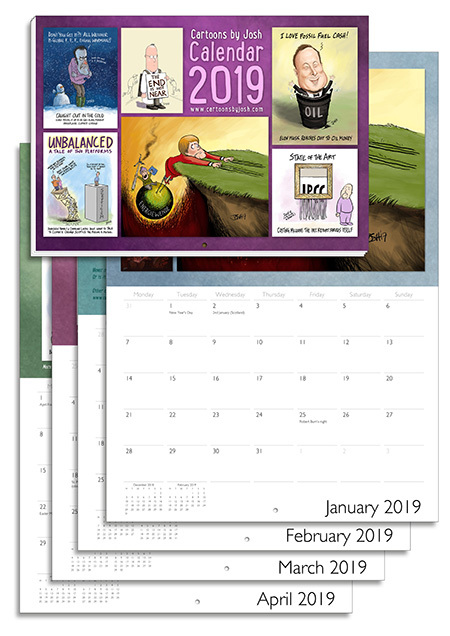 The Calendar has cartoons from the past year on UK and US politics, Energy, Environment and Climate Change and one or two caricatures. I draw cartoons on politics, energy and climate change which are now published mainly on Twitter and also appear on Watts Up With That. Many previous years cartoons are posted on the BishopHill blog. Although the cartoons are my copyright you may post the cartoons on non-commercial blogs as long as you link back to this site (www.cartoonsbyjosh.com). If you want to use any of them on a commercial blog or website, in a printed or on-line journal, newspaper or any other publication, or use them in connection with any for-profit business or commercial usage then please contact me for higher res versions, permissions and rates. I accept commissions for books, reports, websites or personal gifts – do get in touch via email [ josh at cartoonsbyjosh.com ] or via the Contact page. If you wish to translate a cartoon into another language then again please get in touch. Please do not alter or modify any cartoon. Thanks for visiting and if you can donate any funds at all, please do – it is greatly appreciated!